According to researchers, the majority of cleft lip and palate cases are caused by some form of interaction between genetic and environmental factors. An exact cause among most babies isn't discovered. 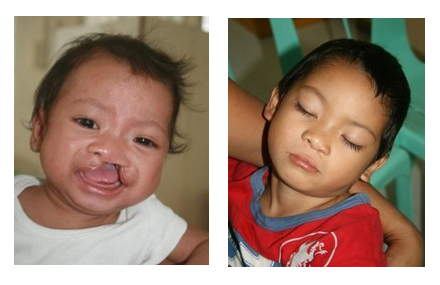 The Ruel Foundation is a cleft lip and palate charity that has volunteers that work to locate children living in poverty in remote areas of the Phillippines, Vanuatu and Fiji Islands that suffer from this birth defect. In most cases, these children are overlooked due to their isolation and a lack of funding. Ruel Foundation staff work closely with local authorities to process these children for cleft lip and palate treatment. Cleft lip and palate surgery is carried out in local healthcare facilities by local staff and surgeons. It costs an average of US$375.00 to provide such treatment for each child. This includes accommodation, transportation, medication, doctors' visits, as well as pre-op and post-op checks.